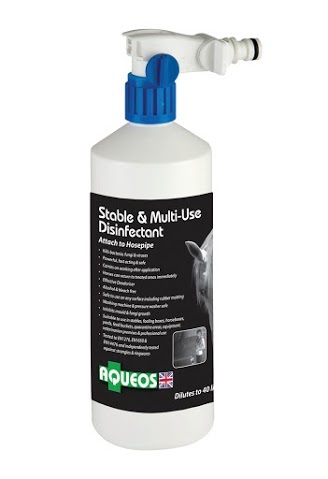 A stable and multi use disinfectant that kills bacteria, fungi and viruses in seconds. Ideal for use in stables, yards, lorries and quarantine areas. The bottle easily attaches to a hosepipe and will automatically dilute. this fast acting, powerful multi-use disinfectant kills bacteria, fungi and viruses in seconds and also carries on working after application. Safe to use on any surface and can be used in washing machines and pressure washers.